We have rigorously benchmarked our automated methods to ensure that they are as accurate as manual curation, though there are many proteins to which our methods cannot be applied. SCOPe also corrects some errors in SCOP. 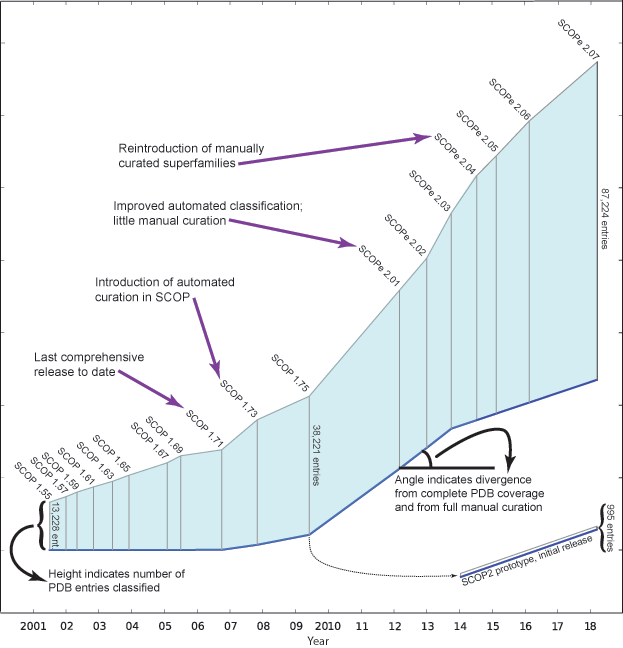 SCOPe aims to be backward compatible with SCOP, providing the same parseable files and a history of changes between all stable SCOP and SCOPe releases (available on the Stats & History page). For backward compatibility, SCOPe entries are arranged in the same hierarchy as SCOP (version 1) entries. What is the relationship between SCOP, SCOPe, and SCOP2? SCOP (version 1) is a database that originated in 1994 for protein structure classification [PubMed]. The last version of this database, 1.75, was released in June 2009 and is still available both in Cambridge UK and on the SCOPe website. SCOP 1.75 classifies 38,221 PDB entries. SCOPe continues the development and maintenance of the classic SCOP hierarchy and may be seen as a continuation of the SCOP database, with ongoing updates and new classifications [PubMed]. SCOPe is completely backward compatible with SCOP (version 1), including all the same parseable files that we previously released separately in SCOP and Astral releases. As of March 2018, SCOPe 2.07-stable classifies 87,224 PDB entries. SCOP2 represents a marked change from the SCOP classification structure and is currently available as a prototype with only a small number of classified families. SCOP2 replaces the tree-like SCOP hierarchy with a directed acyclic graph, allowing curators to represent structural and evolutionary relationships between proteins in more precise detail. There is no division of proteins into domains with fixed boundaries; instead, node-specific bounaries define the protein regions for each particular relationship [PubMed]. As of March 2018, the SCOP2 prototype classifies 995 PDB entries. In the interest of scientific reproducibility, when you publish a manuscript or give a talk about data you obtained from SCOP or SCOPe, it's crucial to unambiguously refer to the data you used. Using these citation conventions will provide all the information needed for other researchers to accurately download the same data that you are working with. For related help, see sections on backward compatibility with SCOP, stable releases and updates, and stable identifiers. In order to facilitate use of SCOPe data by SCOP and Astral users, we provide SCOPe data in parseable files in the same formats as the SCOP and Astral databases. SCOPe uses the same stable identifiers (e.g., sunid, sid, sccs) as were used for prior releases of SCOP and Astral, and the same protocols previously used to assign new SCOP and Astral identifiers are also used in SCOPe. A history of all changes between consecutive releases of SCOP and SCOPe is available on the Stats & History page. Like all previous SCOP and SCOPe releases, SCOPe 2.05 is "stable," meaning the data will not change until the next release (although we will continue to make improvements or bug fixes to the interface). Our current infrastructure imports and classifies new PDB files on a weekly basis. Starting with SCOPe 2.02, we are also producing periodic updates that add newly released PDB entries the classification (approximately monthly). These periodic updates add new entries to the current release, without affecting older domains. Sequences for the newly added chains and domains will not be included in the Astral subsets until the subsequent stable release. Periodic releases are named by appending the stable version number with the release date of the periodic release (e.g., "SCOPe version 2.02-2013-06-20"). Stable releases are explicitly labeled stable on the website and downloadable files, (e.g., "SCOPe version 2.02-stable") to avoid confusion in cases where different files representing either a stable release or a periodic update are available. Note that these periodic updates will not replace stable releases or the files we make available with each stable version. Because stable releases of SCOPe (and the Astral subsets) are commonly used for benchmarking, we plan to continue producing stable releases as well as periodic updates to those releases. The stable releases will include any changes (such as merging or splitting clades, moving clades, or changes and corrections to domain boundaries) that curators make to the classification. The most recent periodic release corresponding to each version of SCOPe will be available on the website, in addition to the stable releases. Parseable files corresponding to previous periodic releases are available on request. It is also fairly trivial to reconstruct earlier periodic releases using subsequent ones from the same stable release, since the date when each node was added to SCOPe is shown on the Stats & History page) and also stored in the MySQL database. More recently added nodes never affect earlier ones (all changes are made in the subsequent stable release). In order to move toward our goal of complete coverage of the PDB, we have re-introduced manual curation of new Folds, Superfamilies, and Families in SCOPe 2.04. We examined and classified structures from the largest Pfam families that were not included in SCOP 1.75. In curating members of the 34 largest unrepresented Pfam families (each with at least 20 structures not previously in SCOP), we added 18 new Folds, 25 new Superfamilies, and 47 new Families to SCOPe 2.04. Aided by improvements to our automated curation method, we increased the fraction of classified PDB structures from 65% in SCOPe 2.03 to 68% in SCOPe 2.04. Manual curation in SCOPe is performed by John-Marc Chandonia. Dr. Chandonia has reviewed Alexey Murzin's annotations since 2001 as part of the Astral build process, including dialog regarding manual classification errors. He has followed the same conservative principles as Dr. Murzin in deciding whether to annotate newly structurally characterized proteins as homologous to prior structures. We also invite collaborations with experts in particular superfamilies; if you would like to help us update part of the SCOPe hierarchy, please contact us at scope@compbio.berkeley.edu. Macroglobulin: The complement system is an ancient system for immune response, pre-dating the immunoglobulins. Eight domains (red and pink) from mammalian C5 (3cu7) belong to different families in the new macroglobulin superfamily. Zn aminopeptidase insert domain: Several recently characterized proteases, including ERAP1 (2yd0), which is associated with chronic inflammatory disease [PubMed], contain an immunoglobulin-like domain not previously observed in proteases. DDB1-like: DDB1 is part of an important complex that regulates DNA repair, replication, and transcription [PubMed]. Three domains from 2b5l belong to this family: one is shown in red and the other two in pink. A novel C-terminal fold is also shown in blue. PA14-like: The Anthrax Protective Antigen (APA) fold, classified in SCOP 1.75 as a single multi-domain fold, was split into N- and C-terminal portions because members of the PA14-like superfamily (e.g., d3abza3 shown in red) have recently been structurally characterized in a variety of different enzymes. The vast majority of new protein structures solved represent a new experiment on a protein that was already structurally characterized (Chandonia and Brenner, 2006, available on the Help > References page). Our goal in implementing automation is classify structures that can be reliably classified in the existing SCOP hierarchy, without sacrificing the reliability of the database, which has been maintained through years of expert curation. We introduced a new automated assigment protocol in SCOPe 2.01 (described here), which classified only single-domain chains, and extended it in SCOPe 2.03 (described here) to classify some multi-domain chains. Removed the restriction on low-resolution, NMR, and ribosomal structures. Removed two-domain limit, permitting chains with any number of domains to be classified. Increased the number of residues by which we extend BLAST annotations to chain ends or gaps, from 10 to 15 residues. Removed the requirement that the BLAST hits used for the two domains in the chain not be to the same target SCOPe domain. To ensure that these changes would not increase our error rate, we applied the same tests described in the Benchmarking section, below. We first create a BLAST database containing the SEQRES-based sequences for each domain in SCOPe. Then, for each newly released PDB chain, we BLAST its SEQRES sequence against the domain sequence database. BLAST performs local alignment, returning the start and end of the alignment (the hit) for the query sequence and the target sequence, as well as the E-value. We collect only the BLAST alignments where the E-value is at least as significant as 10-4 and the alignment covers most of the target domain (defined as missing at most 10 residues from each end). We group the alignments by the PDB chain to which the targets belong and rank the groups by the total number of residues covered by the hits on the query chain. We then use the top-ranking group of BLAST-based alignments to annotate domains in the query sequence. If the BLAST boundaries are outside the observed residues in the query chain, the assigned SCOPe domain is shortened to include only observed residues. The boundaries are then extended by applying two methods. If the nearest PDB chain end or gap in ATOM records is within 15 residues of an alignment end, we extend the domain to include these residues. If a region between two alignment ends is 10 residues or shorter, we extend the two domain boundaries to fill the region. The purpose of extending the BLAST hit is to classify every observed residue (i.e., one with ATOM records) in the chain; the 15-residue limitation makes it very unlikely that the extension will include a new domain. Any longer gap between BLAST alignments or chain ends results in the chain being put on hold to await manual classification. After making predictions for each chain, we apply some criteria to determine whether each domain prediction was high-confidence (i.e., sufficiently accurate to be included in SCOPe without further manual inspection). 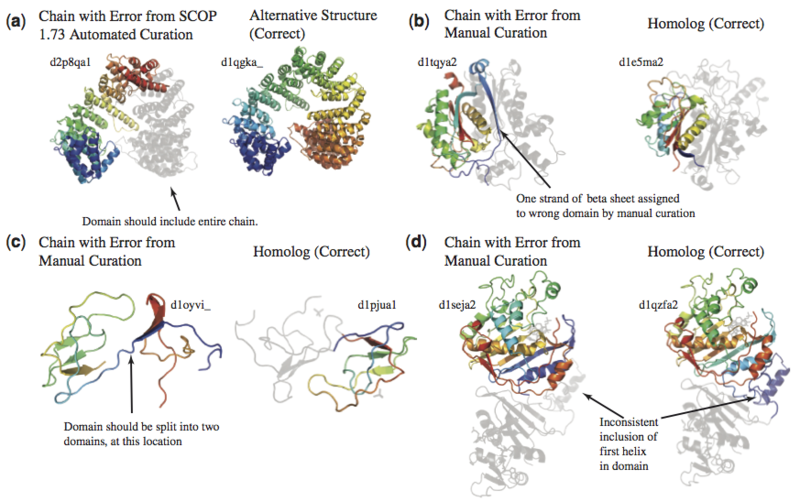 We first verify that each chain contains no domains that are homologous to genetic domains classified in SCOP (due to the difficulty of correctly automating predictions that include multiple PDB chains). In cases where an entire PDB chain was predicted to be a single SCOPe domain, we verify that the target domain also comprised its entire PDB chain. In cases where a PDB chain was divided into multiple domains, we verify that there are no regions in the ATOM records of the chain that are both longer than 10 residues and not assigned to any domain. Family can be assigned if the BLAST percent identity to the previously classified domain is at least 55%, or if the gene annotation provided in the PDB file matched the gene annotation of exactly one family in the assigned Superfamily. Protein can be assigned if the BLAST percent identity to the previously classified domain is at least 99%, or if the gene annotation provided in the PDB file matched the gene annotation of exactly one protein in the assigned Family. This relatively high threshold is required because some paralogs in SCOP have ~98% identity to each other, and are classified as separate proteins. Species can not be reliably assigned based on sequence similarity, but can often be matched to a species in SCOP based on the species annotation in the PDB file. In cases where the protein or family could not be reliably matched to an existing SCOP clade, we created a new group called "automated matches" at the Family or Protein level. These are not true families or proteins, because the domains within each one are not as similar to each other as members of manually curated families and proteins. For example, assignment to an "automated matches" family means the domain could reliably be assigned to the parent superfamily, but could not be automatically assigned to one of the existing families with 100% confidence. Manual curation or future improvements in automation may allow us to re-assign these domains with greater specificity. New SCOPe Species nodes were created if the PDB species annotation did not match any existing SCOP species. To facilitate the mapping of SCOPe Species nodes to PDB species annotations, we attempted to make the descriptions of SCOPe species-level nodes more consistent, e.g., by always using the same common name for a species, and by updating NCBI taxonomy ids that have changed. This resulted in 1,520 species nodes being updated between SCOP 1.75 and SCOPe 2.01. The sunids for these nodes did NOT change, since each refers to the same species as before. Was classified in the same Superfamily as the manually curated domain. Had the same number of regions (i.e., consecutive parts of the sequence) as the manually curated domain. Had all region boundaries within 10 residues of the manually curated boundaries. We have taken a very conservative approach to applying automated classification, in order to ensure that our methods are as accurate as manual curation, even though there are many proteins to which our methods cannot be applied. This means that our automated methods were tuned until they produced zero errors relative to manual curation. In fact, benchmarking revealed some previous errors in manual curation, which we corrected in SCOPe. Over the course of benchmarking, we uncovered a number of errors in domains in SCOP. These were then manually corrected. We detected errors in 70 manually curated domains by running benchmarking and manually inspecting predicted domains that did not sufficiently match the manually annotated domains. These errors in domain boundaries in multi-domain chains were manually fixed in SCOPe 2.03. We also detected and fixed inconsistencies in 5,054 domains that had been predicted and classified with the SCOP 1.73 automated method. We review some of the types of errors detected. A previous automated method introduced in SCOP 1.73 used to predict domain d2p8qa1 had included approximately half the residues in the chain. This was inconsistent with all other manually curated entries in its species-level clade that included the entire chain. Compare d2p8qa1 in SCOP 1.75 to d2p8qa_ in SCOPe 2.01. A strand of beta sheet was included in the d1tqya2 domain by manual curation. Compare d2p8qa1 in SCOP 1.75 to d2p8qa1 in SCOPe 2.03. All of chain I from 1oyv had been placed into a single domain. Compare d1oyvi_ in SCOP 1.75 to d1oyv1 in SCOPe 2.03. The manually curated domain d1seja2 excluded the first helix in the chain. Compare d1seja2 in SCOP 1.75 and d1seja2 in SCOPe 2.03.